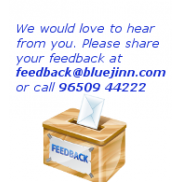 Good rate,great service and on time delivery in last few months of my interaction with Bluejinn.com has made my weekends free of grocery shopping.Keep on doing good job guys!! I get everything I need and there's no minimum order requirement. For Acrylic and Oil Colours.. The kit contains pen (2 colors), pencils, eraser, sharpner, ruler and a marker..